Bijan Beigi is a consultant Ocular Adnexal, Eyelid and Mid face reconstructive surgeon. He specialises in cosmetic injectables, laser resurfacing and lesion removal here at the clinic. 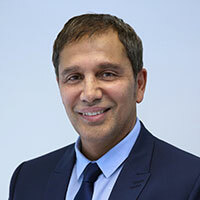 Performing pioneering surgeries within the NHS, he also practices in Harley Street, London and runs a private practice in Spire Hospital offering surgical cosmetic and reconstructive procedures. In addition, he works out of his own clinic, Norwich Cosmetic Clinic. Mr Beigi specialises in various techniques for eyelid reduction and sculpting. He is also an experienced mid-face cosmetic surgeon. With a wealth of experience (over 12,000 operations) and knowledge about eye diseases and reconstruction of bone orbit and the mid-face following cancer and trauma, Mr Beigi is a specialist in cosmetic eyelid and mid-face surgery, in particular for cases with previous surgical complications. Please visit http://mrbeigi.com for more information. Mr Beigi also has a keen interest in nonsurgical cosmetic procedures such as injectables and laser resurfacing and carries out his treatments on patients every Monday.